October 17, 2014 - "Press Releases"
Conductix-Wampfler’s history has some impressive highlights, but perhaps one of the least expected facts about the local manufacturer is that its legacy includes the patent for the machine that makes Ruffles potato chips. 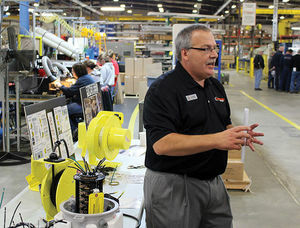 Miller gave a tour of the Harlan plant Oct. 3 in recognition of National Manufacturing Day. Iowa Western Community College, which has its Shelby County Center blocks away from Conductix-Wampfler’s facility, brought students, teachers and community members to an open house to show off careers in modern manufacturing. Conductix-Wampfler is owned by the Delachaux Group, based in Paris, and traces its roots to 1945, with its Harlan facility opening in 1991. The 110,000-square-foot Harlan plant houses machines, metal working, welding, assembly, engineering and warehousing for the company. Many people still have the impression that manufacturing is a dirty, grimy job leaving workers exhausted from manual labor. But Miller showed how workers at the Harlan plant innovate to make their jobs easier while saving money – totaling $1.5 million in cost-cutting last year between the company’s Harlan and two Omaha facilities. “Instead of working harder, we want to work smarter,” he said. The company employs engineers, sales staff, machine controllers, welders, project managers and a variety of other positions, and it designs and customizes most of its products. A mechanist makes between $17 and $19 an hour, Miller said, and a scholarship offered by Conductix-Wampfler will even pay to send high-school graduates to technical school to receive training. More than a hundred high-schoolers from across southwest Iowa, including from the Council Bluffs Community School District’s Tucker Center, also learned about jobs in recent manufacturing during tours of the Harlan plant. Harlan High School Principal John Connell was among those touring the facility. He said students from the Harlan Community School District receive a lot of benefits from the district’s partnership with Conductix-Wampfler. Miller said it’s important for the company to reach out to young people to get them interested in manufacturing and aware that companies like Conductix-Wampfler also need accountants, human resource employees and other office support personnel. Of the company’s roughly 90 full-time employees, 60 work in the plant while 30 work in the office, he said. Students younger than 18 are invited to shadow employees at the facility, while older students can apply to receive scholarships to receive training. Miller said the key is showing that these are careers that are worth pursuing. “When they’re at that age, we’ve got to get them into the manufacturing field,” he said. Rogene Smith, the company’s director of human resources, said Conductix-Wampfler has several open jobs; they can be found at conductix.us.